The chains are silver-plated zinc alloy. They are 50cm/20inches long, and have a lobster clasp. When mounting embroideries into pendant bezels, I use *very strong* double sided, acid-free adhesive tape which I found at my local paper-craft store. You might also be able to use glue that adheres to both metal and fabric - you will need to test it. Cut a piece of acid-free card slightly smaller than the size of the pendant tray. For a 35mm bezel, I cut my card 34mm square. Cut the embroidery so that it is 2cm larger than the card - 1cm on each side. Use a long piece of sewing-machine thread and lace the embroidery over the card, ensuring that the embroidery is centred. Firmly press the back of the embroidery onto adhesive in the bezel. Cut a circle of acid-free card slightly smaller than the size of the pendant tray. For a 38mm diameter bezel, I cut my card with a 37mm diameter. (Cut carefully so that it really does turn out round - details matter.) Cut the embroidery so that it is about 2cm larger than the card - 1cm extra around the edge. Stitch a line of running stitch 5mm in from the edge of the fabric. Gather the thread up tightly, ensure the embroidery is centred, then tie a strong knot. Trim the excess thread. Firmly press the back of the embroidery onto adhesive in the bezel. 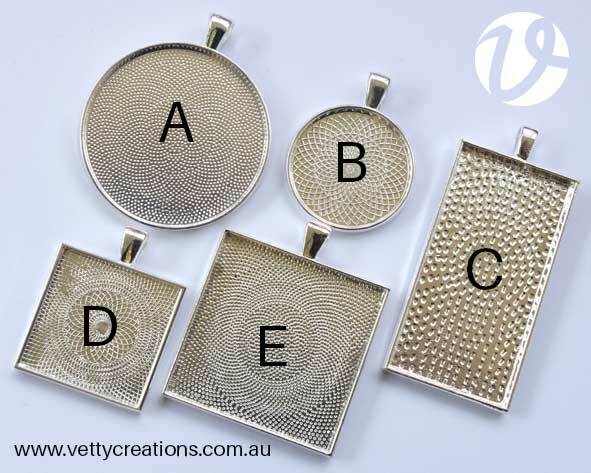 NB: If you are looking for our range of counted thread embroidery pendant kits, they can be found here. Silver-plated zinc alloy chain. 50cm/20inches long, 3.2 x 0.5 mm. Lobster clasp. 2 x silver-plated zinc alloy chains. 50cm/20inches long, 3.2 x 0.5 mm. Lobster clasp. 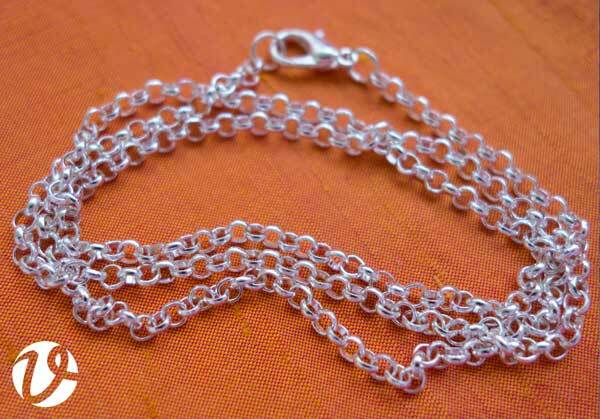 3 x silver-plated zinc alloy chains. 50cm/20inches long, 3.2 x 0.5 mm. Lobster clasp. 4 x silver-plated zinc alloy chains. 50cm/20inches long, 3.2 x 0.5 mm. Lobster clasp. 5 x silver-plated zinc alloy chains. 50cm/20inches long, 3.2 x 0.5 mm. Lobster clasp.